Our challenge this week is a card challenge - create a black and white card! One accent color may be used. This week's challenge is inspired by old black and white films. The real turning point from black and white to color in the movies was the film "The Wizard of Oz." This 1939 movie starts out in black and white, transitions to color, and then back to black and white again. This was the first time many movie goers saw color in film. Some notable black and white movies include "Young Frankenstein," "Night of the Living Dead," "To Kill a Mockingbird," "Invasion of the Body Snatchers," "Schindler's List," "Psycho," and most recently, "The Artist." 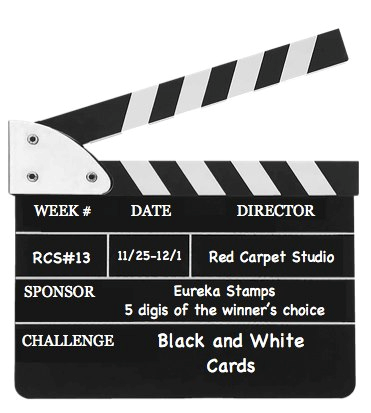 Our fabulous sponsor this week is Eureka Stamps! The winner will receive their choice of five digital stamps. Along with the randomly chosen winner of this week's challenge, the card design team will also be taking a look at ALL of the submissions and voting on their top three "spotlight"submissions. The spotlight submissions, along with the random winner, will be announced on Tuesday December 4th and will receive a special badge for their blogs. For this weeks black and white card challenge I decided to use one of my favorite cartridges Create A Critter 2. I thought this cute little penguin with his scarf was perfect. The black and white polka dot paper is from Bazzill Basics Paper Licorice. Doesn't it looked like snow in a dark sky? 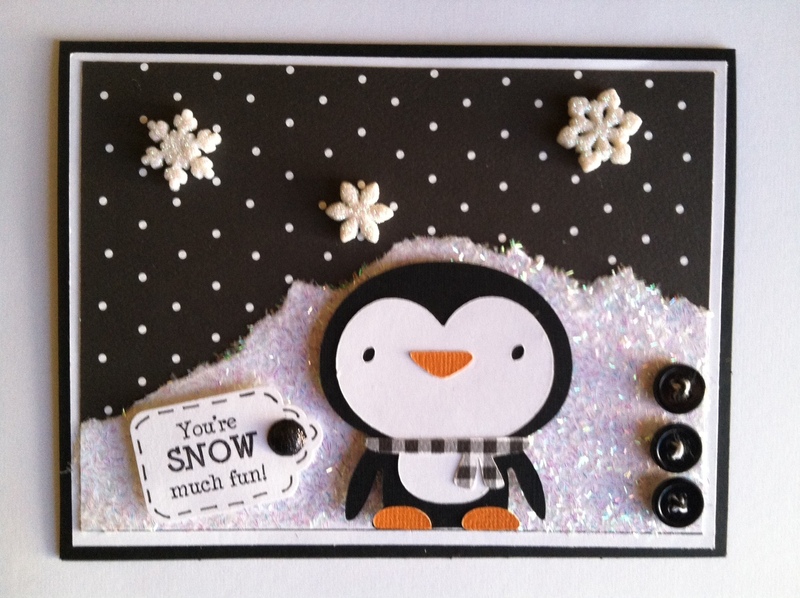 I then tore a piece of white cardstock and added Recollections Tinsel Glitter to make it look like snow hill. The sentiment is from Cardz TV Snow Day. Here's a close up of the snow hill. This is a super fun challenge. Hope you to see your entry! Love it. Makes me want make just like it. Cute, cute, cute!!!! Love this! Love the snow! Great holiday blog too! You guys ROCK! This is just adorable! What a cutie. I love the glittery snow. This is so adorable. 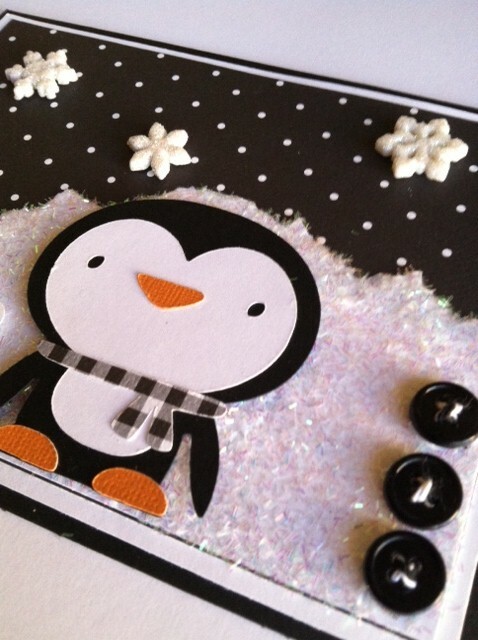 I love the penguin and glitter.